This feature is optional; if you don’t see it in the main menu, that means it’s not enabled yet. See the admin documentation for details. Zammad supports detailed time accounting to help administrators keep track of how much time you spend on any given ticket, customer or client organization. 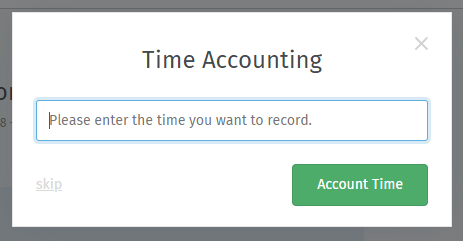 If time accounting is enabled, this dialog will appear each time you update a ticket. Enter how much time you spent on it (in minutes, or whichever unit of time all your other colleagues are using).